On the left at the end of the West Pier. Being brought up on the North side of Dublin, I have always had a particular affection for Howth and indeed Clontarf. As a child, my parents would take me out on a Thursday evening, which was the day to buy fish from the trawlers. It is a time I remember fondly. Howth is a great place and very easy to access now by DART, so you can just stroll down the pier to Aqua and have a great experience. Aqua really is the quintessential Howth seafood restaurant, not only because of its seafood, but because the location is so stunning, right out on the water. The inspiration for a restaurant right at the end of Howth’s West Pier, in what was the old Howth Sailing Club, came about as the owners of Aqua, keen sailors themselves, would often sail past and reminisce about the building. Renovations to restore the atmospheric building started in 1998 and on Millennium night 2000, with a firework lit backdrop, Aqua restaurant came to life and has not looked back since. It is really pretty stunning sitting by the windows of Aqua and looking out at the deep waters; you feel as if the next stop is Holyhead. They even have their own pod of seals which live around the pier and draw lots of people during the summertime to enjoy them. The sea is your oyster at Aqua, with starters including baked crab claws with coriander and lime crème fraiche to start or perhaps deep fried calamari with a lightly spiced tomato sauce. Terrine of foie gras comes with a tropical fruit puree, micro herbs and grape salad, whilst a plate of smoked fish includes top quality smoked salmon, sea trout pate, mackerel and haddock. They also do a fab lobster and crayfish salad starter and of course a half dozen oysters are de rigueur. Mains include all of those top notch dishes we all love such as Dover Sole on the bone and fabulous grilled Irish lobster, which you can have in two sizes, depending on how greedy you are – I’m greedy! Panfried fillet of cod is served with celeriac puree, asparagus and white wine sauce, whilst seafood fettuccine has prawns, salmon, cod and smoked coley in a spicy creamy saffron sauce. 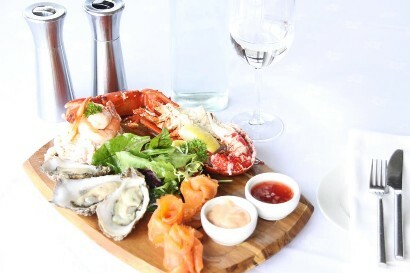 They also do a great cold seafood platter for two with a half lobster, prawns, oysters and smoked salmon. As well as great seafood, there are of course great viand options. Their beef, lamb and pork is Irish, and a cracking fillet of beef comes with red onion compote, grilled tomato, herb aioli and Balsamic dressing, whilst saddle of venison comes with braised red cabbage and a Madeira jus. Aqua also does a midweek lunch from Wednesday to Friday, which offers excellent value as well as a very popular Sunday lunch. They also do an excellent Early Bird.